There’s a disarming charm and a refreshing simplicity to the advice given by Shumaila Ahmed, aka Dubai Veg Growers, an increasingly popular blog and Facebook site that offers tips on home-grown food, cooking and recipes to gardeners in the UAE. In part, this stems from Ahmed’s skills as a communicator; online posts have titles such as “Picking beans in PJs” and “How many ways can you use a coconut”. Readers also respond to Ahmed’s honest assessment of her own gardening expertise and her knack for understanding just how much detail is necessary when planting the seeds of horticultural wisdom. In a recent post on making your own fish-based liquid fertiliser, Ahmed took her readers through the process, one detailed photograph at a time. The first time Ahmed tried to grow anything from seed was a case in point. Having been told that she was buying compost, it didn’t take very long for her to realise that she’d actually been sold a bag of animal-based fertiliser instead. The smell was the biggest giveaway. 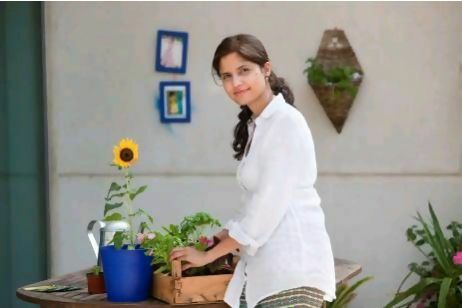 Now plants grow on every available surface in Ahmed’s garden, including the walls where she is experimenting with salad leaves, rocket and lettuce in a home-made vertical garden made from converted guttering pipes. Ahmed also approaches local landscape contractors to recycle plant pots that would normally be discarded after their gardens have been planted. She also recycles her own waste in an indoor Bokashi composting system that provides her with invaluable material with which to enrich expensive shop-bought potting compost and garden soil. As well as her blog and popular Facebook page, Ahmed also looks after her family while working on an MA in International Studies and Media. “I am trying to be good this season and not do too much, but I’m always tempted,” she says.